Plugin requires use of WordPress version 4.5 or newer and bbPress plugin version 2.5 or newer. Plugin stores purchase codes users enter, so each code needs to be entered only once, and later visits to support forum will automatically verify that code exists. This way, verification process is not intrusive on your customers and doesn’t require using code with every visit. 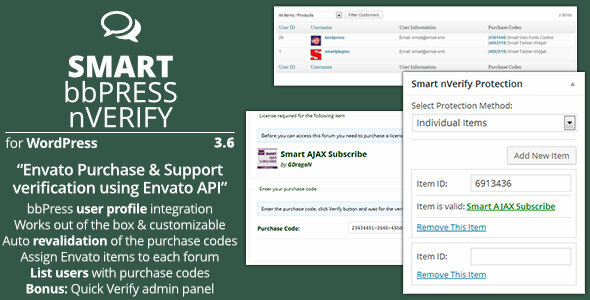 Since version 3.0, plugin can verify purchase code and support period expiration for purchase code so you can limit forums access to users with expired support period. This is disabled by default, and you need to enable it to use it. If you notice any issues, please report them. There are different options for controlling support expiration, including option to disable support check for items purchased before September 1, 2015. You can also setup exception items for support check. Plugin uses Envato API to verify purchase codes and supports new API using personal token for authentication. You can restrict access to forums using three options: restrict access to forum (hides even the list of topics in protected forum), restrict access to new topic form (user can see list of topics, but form is not available) and restrict access to actual topic content. Plugin supports use of new topic forms outside of the forums where user all can select forum to post to from drop down list. In such case, validation is also done. Restriction screen shows list of products assigned to a forum (so the users know which plugin license they need), and you have one field to enter purchase code and button to verify it. Depending on the verification (done through AJAX) user will see error or success message. If code is verified, page will refresh and show protected content. If the Envato API is not responding for some reason (maintenance on Envato), message will be displayed and user should wait before attempting verification again. For each forum you can assign one or more items, but you can also switch forum protection to any item for your Envato account. This way you can have general access forums that require purchase code from any of your items, without the need for you to list each item. Default templates plugin has to display restriction message, also show the user step by step information on how to get the purchase code. All templates plugin have can be overriden by the theme so you can customize further the way those pages look like. On plugins panel in the administration, you can see list of all users with registered purchase codes. You can filter the list by product and sort it by user ID or username. You can see all the information about each purchase code. List also shows registration date for each user and links to their topics and replies for faster access to their support topics. You can unlink purchase codes if you need to (remove option added to the list of registered codes). This means that can be used again by other users. This is useful when you are testing the system. Your forum users can also see all purchase codes they have registered, and it allows them to add new codes in bulk. This way they can add codes faster and they can keep track of all codes they used. They can add multiple purchase codes for same product. Check Envato API online status before displaying the form to enter purchase code. Options to disable bbPress RSS Feeds to avoid exposing topics and replies though RSS. Several functions and actions for developers to get more control over the plugin. Integration into admin side list of forums bulk editor to assign or remove Envato items from multiple forums at once. Support for Envato support item URL redirecton to auto resolve it to a sub forum on your website. Auto revalidation of purchase codes in case the purchase is refunded or reversed. Option to revalidate all purchase codes for every customer in the Customers list. Use of transient cache (time limited) to cache all API responses to speed up API related operations. Tool to cleanup transient cache for all previously made API calls. Restrict use of one purchase code for one user account. Control user roles that will have unrestricted access to protected forums. Allow items from more than one Envato author for individual forums. Error log with all errors logged when making API calls for old and new API. Plugin depends on the templates loading system in the core of bbPress plugin. If you use some other system to replace bbPress templates loading and control, you will need to adjust that to work with Smart bbPress nVerify. Plugin stores purchase information into database connected to users on your support forum. This means that your customers must register for an account on your website to access support forum. This plugin can’t be used if you allow anonymous posting in support forums. Plugin contains PDF user guide and developers guide in the plugin package, inside the ‘docs’ directory. Check out these documents to get information on plugin options, usage and more.